Congrats, you’ve made it through Q3 of wedding season! You may think you’re out of the non-air-conditioned-outdoor-ceremony-in-the-summer woods and you’d be right. However, we’ve almost made it around the horn back to proposal time. You, my friend, are at risk of getting invited to no less than seven engagement parties. And then the couples showers. Before you know it, it’s June and you’ve forgotten which Groom you’re patting on the back! You need party games in this moment. You don’t have to be stuck in matrimonial monotony! You have a duty to yourself and to other wedding attendees to slowly infiltrate the wedding planning process with digital party games, available on multiple platforms that use mobile devices as controllers! Engagement Parties: Engagement parties are basically normal parties but with one huddle up where the couple tells the proposal story and thanks everyone for coming. Before the father of the bride or the intoxicated best-man-to-be launches into an awkward preview of their wedding toast, it’s the PERFECT TIME to play a Quiplash 2 round, customized to the couple! Here’s a guide to creating custom episodes of our games. Wedding Shower: The “Who Has the Most Stuff in Their Purse” scavenger hunt game is an old and semi-awkward favorite, but you know what else is an old favorite? Good old-fashioned trivia. Please crowds of all ages with a round of Fibbage 3 or You Don’t Know Jack: Full Stream (coming soon in The Jackbox Party Pack 5) instead! You get an excuse to be on your phone and Aunt Maude gets an excuse to show everyone how smart she really is. Rehearsal Dinners: Weddings are about families coming together and nothing bonds two groups together like a rap battle with robots using text-to-speech! In Mad Verse City, from The Jackbox Party Pack 5, even bland verses are funny when performed in text-to-speech. Heck, why not use this as a testing ground for wedding toast jokes before reception night? We’ve given you the tools, Wedding Participant! Now get some Jackbox Games, get out there and infiltrate help! Weddings are all about planning ahead, so pre-order The Jackbox Party Pack 5 today for your PC/Mac now ahead of its October 17th release. The Countdown is On! Here’s the Trailer and Release Dates for The Jackbox Party Pack 5! You asked once! You asked twice! Then you lost interest for awhile! Then you asked 135,412 more times! Finally, we can share the info you’ve been waiting for. The Jackbox Party Pack 5 will be released on Tuesday, October 16th for PS4. Just a short 24 hours later on Wednesday, October 17th, it will be available on all platforms, including Xbox, Steam (PC/Mac), Nintendo Switch, Comcast Xfinity, Apple TV and Mac App/iPad. Just in time for your ill-advised Halloween shenanigans! Don’t rely on your already over-stuffed brain to remember these dates! Pre-order The Jackbox Party Pack 5 right now for your PC/Mac on our website here. We’ll notify you when your Steam code is redeemable upon the game’s release! What do you think of the trailer? Let us know on Facebook, Instagram, or Twitter. Unless you hate it! 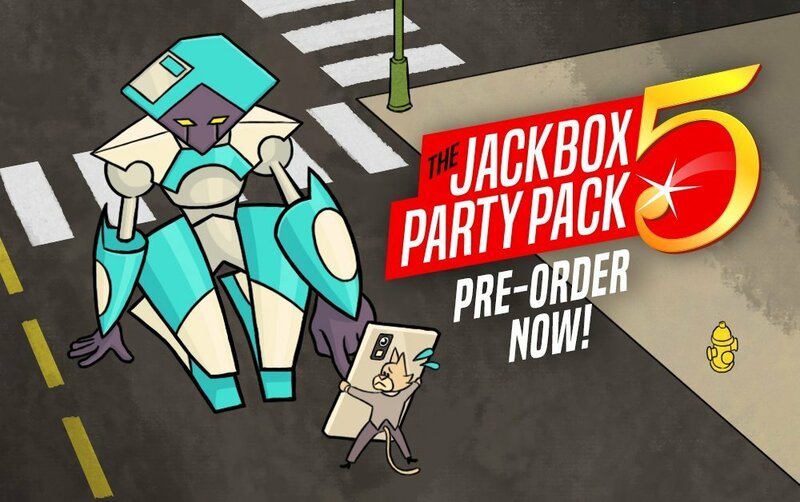 You Can Now Pre-Order The Jackbox Party Pack 5 for your PC/Mac! Good News! For the first time ever, if you live in the United States, you can pre-order The Jackbox Party Pack 5 Steam codes right here on the Jackbox Games website! Steam codes can be redeemed and played on your PC or Mac when the game launches in October. First, you will need to visit our official shop to make your purchase. Then, check your email to receive your Steam code and instructions for how to redeem it when the game officially launches! The Jackbox Party Pack 5 will be available with a pre-order discount. Get the game for $24.99 instead of the full price of $29.99 when the game launches. Don’t worry about missing the official launch date. You’ll get reminders from us! Lock in your Halloween party plans with 5 amazing new party games! Start your holiday shopping early. Pre-ordered Steam codes will be active in time for the holidays and can easily be shared with family and friends when gifting the game. NOTE: When you make a pre-order purchase, you will be emailed when the game officially launches in October with a reminder to redeem your code and start playing. Pre-orders are only available as Steam codes and not available on other digital platforms. The Jackbox Party Pack 5 will be available on other platforms, including PS4, Nintendo Switch, and Xbox One, when the game officially launches. 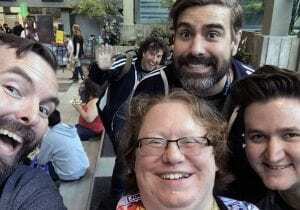 Our Favorite PAX West 2018 Pics! 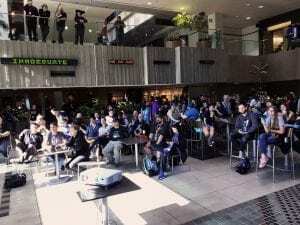 For this #FlashbackFriday, we’re sharing some behind-the-scenes pics from PAX West 2018. Better late than never, right? 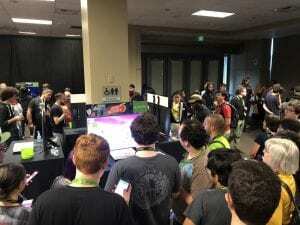 We had a great time playing The Jackbox Party Pack 5 with attendees. 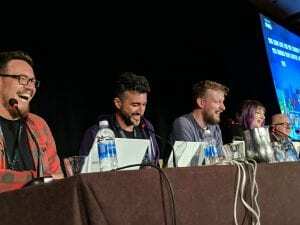 If you haven’t checked it out yet, you can watch the Jackbox Party PAX panel here. The Jackbox Party Cart out and about making morning lines less morning line-y. Playing games at the ID@Xbox Pre-Pax open house. So many people stopped by our table that we ran out of buttons at the ID@Xbox Pre-Pax open house. 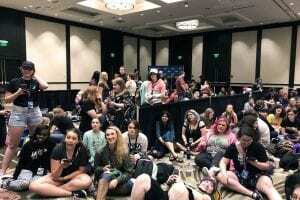 Thanks to everyone that stopped by the stage and played The Jackbox Party Pack 5 with us! We loved meeting fans all weekend! Charlene stopped by the stage with some cool fan art. We infiltrated the Jacksepticeye line and played Mad Verse City! 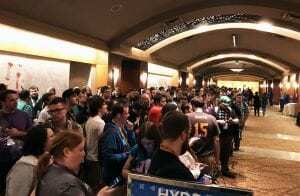 Waiting in line for the Jackbox Party PAX panel to start. 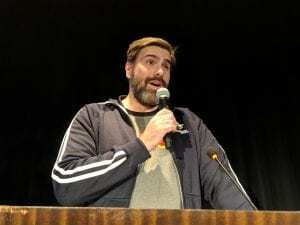 Arnie in action at the Jackbox Party PAX panel. 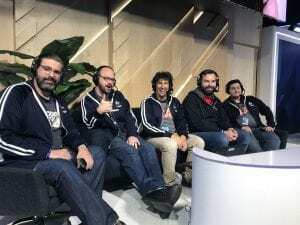 If you ever need excellent panel participants, ask: Ben Brode, Kris Straub, Graham Stark, Kate Stark, and Jerry Holkins! 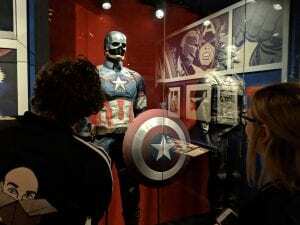 We had a lot of fun checking out Marvel memorabilia at the Twitch party! 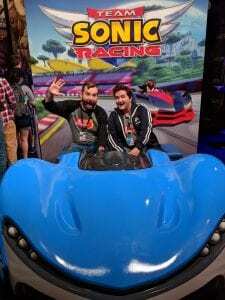 Maybe TOO much fun at the Twitch party. 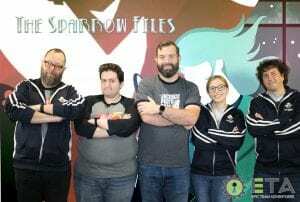 It was awesome to be a part of the Acquisitions Incorporated show on Sunday night. Thanks to all that participated in the pre-show voting! 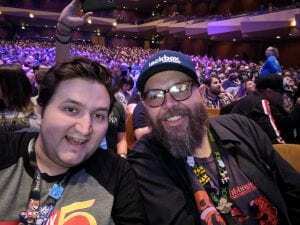 Bravo to the Acq Inc. team for putting on a great show! The Jackbox crew hard at work. 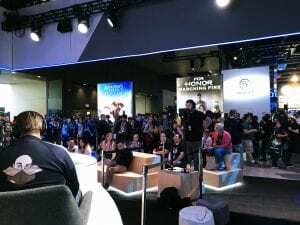 Getting ready to go live on the Facebook Gaming stage. 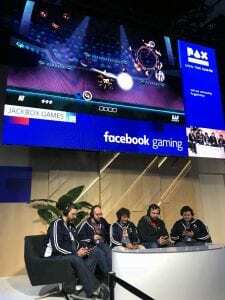 First public stream of Zeeple Dome on the Facebook Gaming stage! 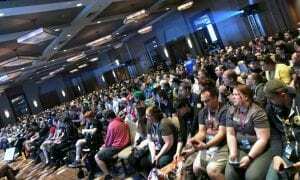 The view from the Facebook Gaming stage while we played You Don’t Know Jack: Full Stream. Ryan and Warren being Ryan and Warren! 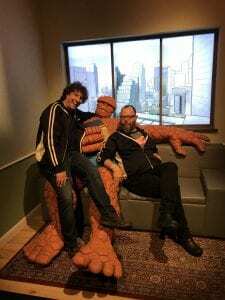 And, we ESCAPED a ROOM! One night, your electricity goes out and you have to find something else to do besides playing Jackbox Games. Nine months later…you have a new player. 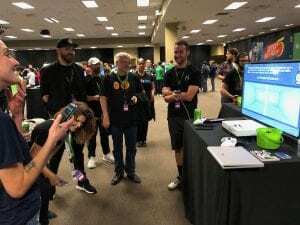 Jackbox Games are the go-to entertainment option for raucous parties and meetings between heads of state, but which ones are best for playing with a PG-rated crowd? All of our games are rated T for teen, but once you turn on the Family Friendly setting (found in the game’s settings menu), you’ll find they’re great for your (cool) family. Here are a few games that are fun to play with kids around the ages of 9 and up. 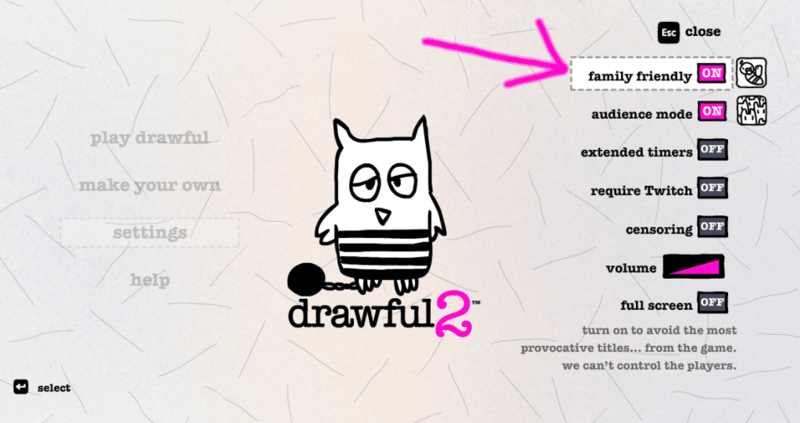 Drawful 2 is a game of hilariously bad drawings. Each player gets a weird phrase that they have to draw, like “night farmer” or “boring graveyard.” The other players see the drawing and make up a title for it that might fool everyone into thinking it was the original prompt. You get points for fooling people with your title and for people guessing the correct title to your drawing. No one likes fooling adults more than kids, and even if your kid doesn’t care much about the rules, making weird drawings together is a ton o’ fun! 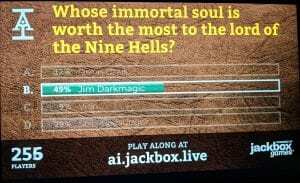 One of the best parts about many Jackbox Games is that there is no “right” answer. Options like Quiplash 2 emphasize creativity, with the goal of making a hilarious joke. Of course, comedy is particular to the audience. Some will find this blog very funny (champions), others will not (criminals). This game is great for your whole family to play because you’ll get to make each other laugh with family inside jokes and shared experiences. You make the content, so use the Family Friendly setting for the prompts and make sure Uncle Mike knows what’s appropriate to write. Playing trivia with kids can be tough, because an 11-year-old has a much different knowledge base than someone in their thirties (unless that 30-year-old writes for Jackbox Games). Guesspionage is a trivia game based on approximation. Instead of just saying “I have no idea” you can just estimate “around 25%.” It means no one is left out of the game because no one will know EXACTLY what percentage of people put ketchup on their hot dogs (criminals). When I was 10, I was playing board games with my family and my dad did a drawing of a cat that was so bad we brought it up at my recent wedding rehearsal dinner. Sometimes family game night can lead to memories (A.K.A. embarrassments) that will last forever. Tee K.O. is a drawing game where the players collaborate to make the best (goofiest) shirts possible. And as a bonus, you can even order your design on a real shirt after the game! It’s a fun game and if you’re looking for future gifts, you can kill two-poorly drawn birds with one decently-drawn stone! Fibbage 3 is another game where you get to make up a unique answer to trivia-based prompts. It has all the fun of Quiplash, with the added benefit of gauging how good your kids are at lying. Always good information to have on hand. For family game nights, you might want to try Fibbage: Enough About You (a bonus game mode in FIbbage 3) which asks players to lie about people in the room and finally discover what rumors about Uncle Mike are real. Pick up one of these games to enjoy with your family today!